Housed in the historic Jose Theater in downtown San Jose, the central business district of Silicon Valley and home to companies like Google, Cisco, Yahoo, the San Jose Improv is an ideal and unique setting for corporate events, wedding receptions, business meetings, and fundraisers. The club can seat up to 450 and offers a variety of food and cocktail choices with plentiful parking in the area. 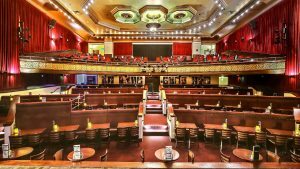 Able to facilitate different types of presentations as well as live bands and DJs, the San Jose Improv is the perfect setting for a memorable event.